The notion that music can make you “smarter” has been very prevalent in popular culture and amongst academics for over two decades. In fact, in 1998, the governor of Georgia sent a free Mozart CD home with every newborn infant in the state (Sack, 1998). While Rauscher, Shaw and Ky (1993) are often credited with publishing the original “Mozart Effect” article, psychologists have published several theories and critiques of the cognitive effects of listening to and practicing music. One of these psychologists is Fabia Franco of Middlesex University, who visited the Goldsmiths Music, Mind and Brain programme on 12th December, 2013, to present her research conducted with Joel Swaine of the Centre for Music & Science at Cambridge University in a lecture entitled “Last tango with the Mozart Effect: Emotion regulation and when music exposure enhances cognitive performance”. 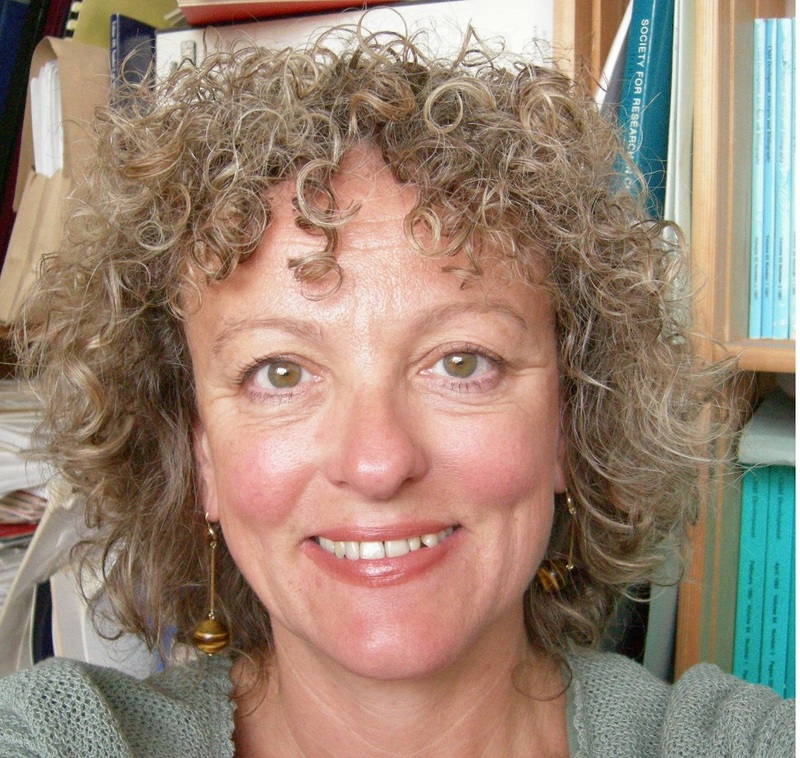 Franco opened her lecture with a summary of the short-term benefits of musical training, which began with the Rauscher, Ky & Shaw study published in Nature, 1993. While psychologists have offered many theories behind the Mozart Effect, the most popular is the Arousal and Mood Hypothesis proposed by Thompson, Schellenberg and Husain (2001) which suggests that the mood of music can induce physiological arousal (“happy” music resulting in a high arousal, positive mood state; “sad” music resulting in a low arousal, negative mood state), causing a direct impact on cognitive performance. However, in the right mood, listeners can feel positive emotion from sad music (Kawakami 2013, Vuoskoski 2012; Sallimpoor 2009). Fabia Franco argued that the interaction between music and emotion is far more complex than the arousal-mood hypothesis and that the effectiveness of the music on influencing cognitive performance depends on how well it matches the mood of the listener (“signal congruence”). The first experiment concentrated on cognitive performance and mood-congruent music in adults who were asked to rate their current mood using a self-assessment test, aiming to identify individuals with moods of similar arousal profile but different valence. After being allocated into a group of mostly ‘happy’ or ‘angry’ people, the participants took part in a digital baseline-test (‘pre-test’). A simple digit-recall task with visual stimuli served as pre-test to avoid any explicit use of the auditory memory. Following this, they were exposed to one minute of a mood-congruent or mood-incongruent solo piano piece in a ‘happy’ or ‘angry’ mode at 139 bpm (beats per minute). Afterwards the participants took part in the digit recall test again (‘post-test’). The experiment showed an increase in performance on the test for women listening to mood-congruent music. Nevertheless, no effect could be seen in the male participants. Due to the gender effect and the self-report nature of the study, the researchers thought that a response bias could be present in adult participants. Thus, they turned to children for participants possibly less affected by gender-related expectations. Additionally, they decided to induce emotion rather than rely on self-reports. 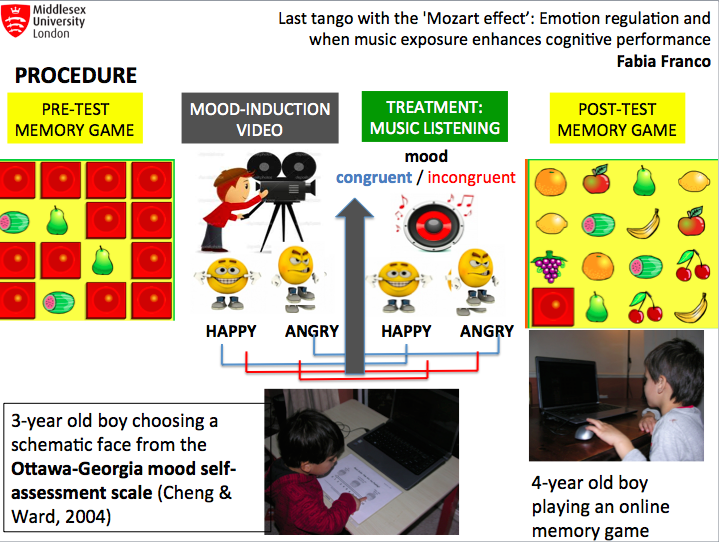 The second and third experiment had similar aims as the first one but examined the effect of mood-congruent music on the performance of children (aged three to five in the second experiment, aged six to nine in the third) on a memory game. The memory game was conducted as a pre-test; the children were then randomly allocated to either a ‘happy’ or ‘angry’ group. In contrast to the first experiment, the mood of the children was induced by showing them a one minute long muted video clip of a cartoon character familiar to them to induce a happy or angry mood based on what happens to the character. Afterwards, the children were asked to assess their current mood and were then exposed to one minute of music followed by another trial of the memory game. No significant effects were found for children between the ages of three to five years, or for children aged six to nine years, although the children listening to mood-congruent music during the third experiment scored better on the post-test. Interestingly, no gender effect was observed in the children. The fourth experiment was an improved version of the second experiment, again investigating participants between the ages of three and five years. The pre- and post-test memory game remained the same but the mood induction was conducted using a three-minute long muted video clips. Moreover, in this experiment moods characterized by both different valence and arousal profiles were used: happy (positive, high-arousal) and sad mood (negative, low arousal). This time the music used was child-directed and used a different bpm-rate for a ‘happy’ and a ‘sad’ melody. This experiment showed a significant effect in the congruent conditions, including the negative one (sad mood/sad music). Overall, these results indicate that cognitive performance may be improved by listening to mood-congruent music; this refutes the Schellenberg et al. explanation that the Mozart Effect is based on ‘positive’ mood induction caused by upbeat and arousing music. As the experiments conducted by Fabia Franco did show a few methodological difficulties, further research is needed to prove this point. Regarding the methods used, one could wonder, for example, whether the short movie clips shown to the children did indeed induce an emotion, and if so, the right emotion. The movie clips were considerably short and were not pre-tested on mood induction in children. Other methodological issues were the reliability of the results from the self-report mood questionnaires for adults (mood induction, for example using the Velten Mood Induction Procedure, could be a valid alternative), the consistency of moods across participants throughout the duration of the experiment, and the learning effect between pre-test and post-test trials; additionally, a control group would be recommended for further research . An interesting aspect to examine in future research would be the effect of background music on cognitive performance (playing the music and doing the task at the same time) as well as the role of mood congruency of the music during this simultaneous music exposure. Due to the potential positive ramifications and popular interest in the benefits of music on cognitive performance, the signal-congruence hypothesis should be further explored and considered for applications as a kind of modern Mozart Effect. Perhaps next time Georgia can send home a CD of songs for every mood! Schellenberg, E. G. (2012). Cognitive performance after listening to music: a review of the Mozart effect. In MacDonald, R., Kreutz, G., & Mitchell, L. (eds. ), Music, health, and wellbeing (pp. 324-338). Oxford: Oxford University Press. Thompson, W.F., Schellenberg, E.G., & Husain, G. (2001). Arousal, mood, and the Mozart effect. Psychological Science, 12, 248-251.